Ever since we decided on building a smart home, my wife was so excited by the idea of choosing smart home lighting. We then started to look into all the options that were available for us, but still, we were not quite sure of the way we wanted to go, we didn’t also have an idea on how to pick a smart home lighting. Having smart home lighting is one of the most adorable and desirable aspects of any smart home project. It may also be one of the most confusing ones if one doesn’t know exactly what they want to control. You can set the lights to go off whenever you are not in a room if the light is set up. You can use Alexa, tell Alexa to turn the lights off or on. You may also set Geofence such that it automatically turns the lights on when you just get home or to turn them off when you leave. Many great things come with having a smart home lighting solution that prompted me to write this article and thus help you in your walk through choosing the lights that will be best for your situation. Why Choose Smart Home Lighting? By having smart lighting, it is a very keen way that will make it look like you are home, even when you are not. This is one of the main reasons why we wanted a smart home lighting. If this is your main aim, then you would really want it to become realistic. Your smart lights should run on a schedule that is specific so that it hides the fact that you actually have things automated. They can be set on an auto timer with sunrise and sunset. A few months ago we left for eight days on a trip to Disney, and we set the lights to automatically turn on in the evenings. We received the funniest phone call while away from one of our neighbors. ‘Are you guys back, we thought you had gone to Disney?’ that helped us to get a good chuckle out of it. Do You Have a Smart Home Hub? Your intentions may not be to turn your home into a smart home. 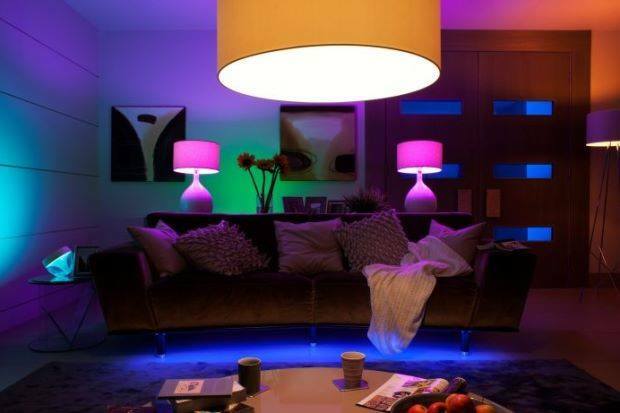 You may just be looking to have smart lighting. If that is the case with you, then you don’t need to have a Hub for you to set up smart lighting which you can control by using your phone and set it up on a schedule. What I typically would recommend for people who not have a hub and/or have no intention of getting one in their home is to get a basic Philips Hue set up and see how it works. They will definitely like it. You can always add Phillips Hue to a SmartThings Hub, Echo, Google Home, Wink and others later on. If you decide that you are going to add other things to the smart home that you already have, like thermostats and security, etc. then you will be required to have a smart Hub, and there are many that you can choose from over here on Amazon. One of my favorites is the Samsung SmartThings Hub. They are compatible with about anything you can get out there, and they are very responsive. They are very handy no matter what smart device you will decide to add to your smart home down the road as well. They wirelessly connect and control a wide range of compatible smart devices from 40+ partner brands, including voice assistants, lights & switches, speakers, cameras, sensors and more. They also enable 24/7 Monitoring: Receive app alerts from connected devices when there’s unexpected activity in your home.Material: Plastic. You can have a look at their current prices and reviews here on Amazon. If you are reading this article, then probably you would say “Yeah! I want to control all my smart home lights!” well, that is so nice, and you can certainly get there anytime soon. But there are three main types of control systems that you can use to light your home. I will get into each of them more here in a moment. Each of them controls different types of lighting. More often than not, it’s even better to address each of them individually. Rather than thinking of your end game as you are taking on this task. For example, in my home, I have recessed lighting in the finished half of my basement, they are about ten of them. I would thus address those different than the lamps that are in our living room or office. Do you just want to control indoor lighting or do you also have outdoor lighting that you would like to control as well? Most people like to have the option of controlling their outdoor lights. If you are looking for nothing more than just some added security, then you would like to check my recommendations for smart outdoor lighting. How many lights do you currently have that are not connected to a switch in any way? This will come to play later on as we discuss your options in the smart home plugs section. But let’s be on point and dive into the three main sections of smart home lighting. These light bulbs screw into one of your existing lamps and are ready to connect to the smart home hub. This is the point where everyone expects to spend a large chunk of change. But the reality is that you may not to spend that much depending on the set up of your house. You may, of course, spend all the money that you want to. But I’m not in any way saying that smart bulbs in every corner of your house are a bad thing. What I am just saying is that you don’t have to spend your hard earned cash if you don’t want to. Especially when you are just starting out with smart things. Lately, we replaced the “Welcome Home” light lamp that is just outside the front door of our house with a smart bulb. This way, when we come home late, we can just flip the bulb on when we pull in the driveway. Then we also found out about Geofencing, and that has made life even better. Once you set up your lights with Geofencing rules, it will automatically come on when you pull in your driveway. You may be preferring to start simple. Maybe you don’t want to turn every build that is in your house into a smart bulb. What I mean is that maybe that is not your end game. Some people prefer to have just a few lights on when they are not at home. If that is the case with you, then I would be just fine if you start out with buying the Philips Hue set up that I had mentioned earlier on in this article. That way you will be able to find out it works and what you can do with it and continue from there. These will typically plug into the wall sockets in your home. Although you can still get full smart outlets which can replace your existing outlet as well. You can still connect your lamp or any other electrical devices that you would like to control like coffee makers or TV. There is no need to have a new light bulb this time. This is another low-cost option and a great feature for lamps as well. We first had this before we went on to install the other smart home products that required us to get a hub. That was our entry point to home automation, and it cured all our interest to what else we could do. You will find that some of them work with amazon’s Echo while some work with hubs. You should make sure that you read the description of the product first before you make your final decision on which one you are going with. You should make sure that it is either compatible with the hub you have or smart assistant. If you are interested in getting the one that works without a hub, you can then check it here on Amazon. Here is the link to most of the smart plugs you will find and do not require a hub. You can go through their reviews as well to establish if they are what you really want for your home. I would say that this is one of my favourite solutions just right out of the box. If you are that person that doesn’t have problems with installing some hardware, then probably you will feel the same. If previously, you had already made some investment in buying and installing LED bulbs in your home, then you have found a very cost-effective option that suits you. This will basically turn the LED lighting that you already have into smart lighting. These will help in providing a great experience because you just replace the existing light switches with some smart light switches. This was the best solution that helped the recessed lighting that I mentioned earlier in my finished basement. This is because I don’t know any person who, in their right mind, would go ahead and spend a lot of time and money to replace ten recessed lights with LED’s and also want to do it over again at a much higher cost. The other option is dimmable smart light switches. You will find that there are quite a few of them out there in the market, and mainly this depends on the situation you are in. For my case, I replaced a dimmer switch for my kitchen and used Kasa TP-Link dimmer switch and have been using it. I’m very happy with it. I have also realized that I’m a big fan of the new Philips Hue Tap. This is a smart light switch that is without batteries. You can have a look at them here on Amazon, the customer reviews as well. You can also have a look at more other Philips Hue switches that are highly recommended. If you are a smart home lighting beginner, the smart home lighting kits are definitely one of the best investments that are worth your money. The reason I say so is that many people have a desire to make their lighting smart (even if they still don’t know it yet). The one piece of advice I would give a beginner and anyone before buying smart lighting kits is not to cheap out at all. If you cheap out, then soon you will regret the decision in the short term. However, there is some good news! The price of getting a good smart lighting starter kit isn’t as much as it used to be previously. You can have a look yourself. You can check the current price of this Philips Hue Starter kit on here Amazon with white LED bulbs. It’s not bad eh?! On the other hand, if you are out looking for something that is so robust, and you aren’t afraid to spend some more money, then you can go with Philips Hue White Color Ambience. You can have a look at their current prices here on Amazon. The one thing about Philips Hue that I like is that they work extremely well and they will give you a jumping off point, so to speak, when it comes to having smart lighting. The one thing that made us to choose the Philips Hue bulbs is how long they can really last. My wife had a problem with the lights we had previously as they were not working properly and were not long lasting. But unlike the other traditional bulbs out there, Philips hue uses LED bulbs which are very popular now because of their longer lasting and reduced costs. Philips Hue bulbs are made to last for up to 15 years or 15 000 hours. The Philips Company claims that each of the bulbs uses 80% less power compared to the traditional incandescent bulb. LEDs are well known for being extremely long lasting products. The rated life of most LEDs s up to 50,000 hours. This is over 50 times longer than a typical incandescent, more than 20 times longer than a typical halogen, and eight more times longer than a typical CFL. If it is used for 12 hours a day, I can last for more than 11 years, and if it is used for 8 hours in a day, can last for over 17 years. Why Do LEDs cost more than other types of Bulbs? Many people ask if LEDs are worth the money because they find them to be pretty expensive compared to the other types of lights. Well, LED is still a new technology, and they are still incurring the high expense of producing quality products. But you may have noticed that their prices have come down over the years dramatically, and they are expected to continue dropping in the coming years. Are they worth it? Well, the extra cost that you will incur in getting an LED may not be that significant if you compare with the cost you will incur to operate a bulb in addition to upfront cost. You will realize lots of energy savings when you use LED lights and this pay back the extra upfront costs that you may have incurred. This then means you will save more money over the life of the bulb. You will also realize that there is a big difference between LED lights of between $10 and %50. This is because quality matters and the LED s are similar to consumer electronics. For an LED to properly function and have the light which is acceptable, all the components of the bulb must be long-lasting. Many LEDs hold true to the financial and energy saving that they promise, but the investment you put in them is only worth it if that can do what they have promised. The industry standard for the failure of LEDs is 3 per cent, but you may still find some that may be experiencing higher failures. This high rates of failures occur for several reasons, and they can always be attributed to some factors. Here are some of the reasons why LED lamps may fail and how you can prevent it. Most of the commercially available LED has many components, and the performance of the LED s is mainly depended on how the components will work together. If you are expecting the lamp to work properly, then all the components must be built to be long-lasting. LEDs that provide sufficient heat dissipation may be weighing and costing more compared to the others. You may also realize that they have a larger chip size, this will help in providing more light and better stability against variations in current. You may also consider looking at the paint and powder coating and see if it is well applied. You may ask the manufacturer to test the LED lamps before they ship them. Diligent manufacturers will always test their LEDs for up to 1o days turning them on and off and leaving them on for periods of time. When they are tested properly, manufacturers can be able to catch any failures in them before they are shipped. This is because LED s are like TVs and other consumer electronics which tend to fail early, that is if they are going to fail at all. When you are installing LED s in an enclosed fixture, you should first check to ensure that they are approved for enclosed places. LEDs that are used in fixtures are those used where there is less than 1/2“around the circumference. If you are planning to use them in such types of applications, then it should be rated for enclosed fixtures. If you use an LED lamp that is not for this type of application may cause the LED lamp to flicker, and this will reduce the life of the lamp. You should also consider the environment in which the lamp is into consideration. If the room is hotter, the lamp will degrade faster. This is because LED s emit light which decreases as a function of time and temperature. You may find some LED lighting products that are made to appear similar to reputable brands. These cheap imitations are usually developed and designed with no regard to patents, trademarks and safety. Having a UL mark means that the LED has been inspected, tested and validated for safety. But you should not easily lie that just because it has a UL mark, then it is real. You may find some LEDs that have counterfeit UL mark or may not be for that manufacturer. You can verify the UL mark online by visiting the UL Online Certification Directory. DLC is a non-profit organization which was created with the main goal of making sure they prevent the failure of LED lights. Does Home Automation Save Money? Can Google Hear my Conversations? Does Google Home Work Without the Internet? HI, I’M SAMUEL, AND SMART HOME GADGETS ARE MY THING! I’ve been building my smart home for 5 years. I recently started thinking of everything that I’ve learned over these years and everything I wish I knew when I got started. I created this site to share with you all of the helpful tips I’ve come across. Hopefully, you will enjoy my posts and be a regular around here! This site is owned and operated by Home Guide Report. Home Guide Report is a participant in the Amazon Services LLC Associates Program, an affiliate advertising program designed to provide a means for sites to earn advertising fees by advertising and linking to Amazon.com. Home Guide Report is compensated for referring traffic and business to this company.